I tend to go through phases where I can continually change the apps I have on my home page, and the apps I use the most. There are however five apps that will never leave their prime positions. These are my most-used apps, the ones I can't function without, the ones I use everyday, over and over again. I love Twitter, it has opened up a whole new world for me, I have friends on Twitter from all over the planet that share my interests. 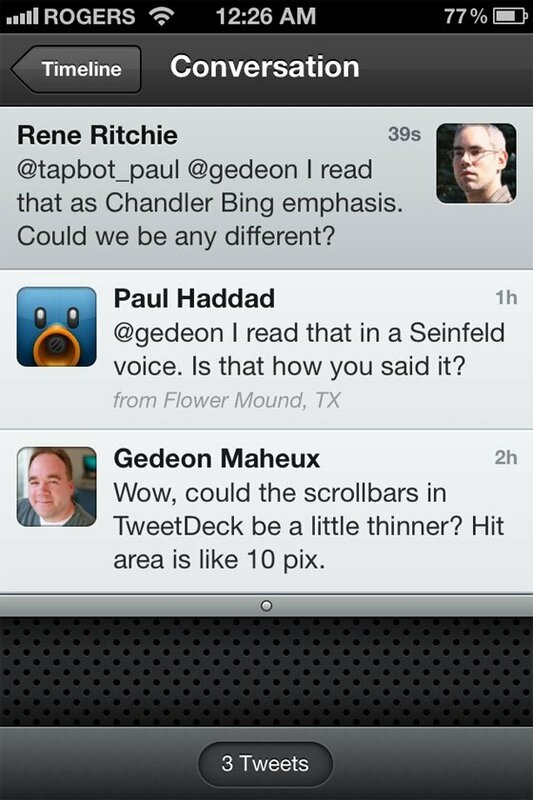 Tweetbot is in my opinion the most elegant and user friendly of all the Twitter apps available on the App Store. Every time I open it, it makes me smile, the subtle sound effects and smooth sliding animations are really well done. It may lack a few features compared with other apps but I would rather give them up just to use this app, it is that good! One of the frustrations of moving your iPhone from the O2 network in the UK, is that it is currently the only network to support Visual Voicemail. Vodafone, T-Mobile, Orange and 3 all skipped this really nice feature. So what are your options? Well HulloMail does a really good job of filling the gap. It is basically Visual Voicemail with loads more additional features. The HulloMail iPhone app offers an easy way to manage your voicemails visually, send, receive and share voicemails, instant voice messaging to mobile and email, no matter which operator you use. There are two versions of HulloMail, a free version which is ad supported and a paid version which costs $8.99 a year via in-app subscription. The subscription version gives you some extra features like an ad-free service for a year, individual greetings, longer voicemails of up to 5 minutes and priority access to more features in the coming months. If your network does not support visual voicemail, give HulloMail a try, it is an excellent voicemail management tool. Being a news editor for TiPb means I have to keep on top of the news at all times. I use Google Reader on my notebook but when I am mobile, I use Reeder. It is super clean, super fast and really easy to use. Of course it syncs with Google Reader too so I never have to read anything twice. I use it on my iPhone 4S as well as Reeder for iPad on my iPad 2. Both work equally well with speed being the key ingredient. Air Video is a fantastic app that can transcode and stream video content from your Windows PC or Mac straight to your iPhone, iPod touch, or iPad. It now includes AirPlay support so you can beam all your content onto the big screen too. Your Windows PC or Mac needs a small piece of software installed to communicate with your iPhone, iPod touch, or iPad but once setup you can stream native iOS video content (MP4 and M4V) instantly to your device (rather than having to sync it over first via iTunes). Air Video will also convert non-supported video formats (AVI, MKV, etc) and either store them for later viewing or stream them on the fly so you can watch now rather than having to wait. Air Video is an excellent app that gives me instant access to over 2TB of media on my networked drives. There are two versions, a free version which limits the number of displayed items in each folder and the paid version which removes those limits. Both versions are universal apps; so work great on iPhone, iPad and iPod touch. LiveScore is a fantastic free app that provides real time scores from many sporting events around the world; with a particular emphasis on soccer scores. Every match in the UK league is covered along with most other countries. With this app you will know about goals, yellow cards, red cards, substitutions, you name it, seconds after they happen. The application comes directly from LiveScore Ltd., the inventors of real-time delivery of live sport data and owners of the no.1 ranked football / soccer web site globally. No country restrictions either, fast access to scores and it is a universal binary too.